The grass is always greener at Turfgrass! Turfgrass is the oldest turf company in New Zealand, working with roll out lawn for over thirty years and Readylawn is the original New Zealand roll out lawn, so when you want a lush green lawn that’s guaranteed to perform, there’s only one call to make – Turfgrass for New Zealand's premium rolled turf product. 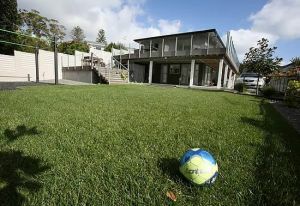 Turfgrass sell the Readylawn brand of rolled out turf in the Auckland region. By combining mixtures of grass seed, we have two varieties of rolled turf which are suitable for the northern climate - both ‘cool’ and ‘warm’ season grass types that are suitable for most applications. Our Turfgrass team love instant lawn. Talk to any of our passionate team members, and we can answer any questions you may have about your new instant turf. From the preparation of your yard, to rolling out the grass, to year on year easy maintenance and problem solving solutions, we have the knowledge and products for greener grass for your property. Not only does Readylawn look great but it is also environmentally friendly. The grass cools temperatures at ground level, it traps dust and smoke pollution particles, it absorbs noise especially in urban areas, cleans the air by absorbing carbon dioxide and sulfur dioxide particles, deters pollutants from entering the soil, it generates oxygen, prevents the erosion of soil, and it recharges water before it reaches the groundwater. Our continuous investment in new plant and equipment ensures that we are at the forefront of turf production in New Zealand.